The Microscope is an international peer-reviewed journal founded by Arthur Barron in 1937 and dedicated to the advancement of all forms of microscopy for the biologist, mineralogist, metallographer or chemist. No matter what the field of research, the microscope is always a useful adjunct and often an essential tool. A successful journal for microscopists must, therefore, interest and benefit scientists from a wide spectrum of fields. The Microscope accomplishes this by emphasizing new advances in microscope design, new accessories, new techniques, and unique applications to the study of particles, films, or surfaces of any substance. Its readership includes microscopists from a variety of industries, including pharmaceuticals, law enforcement, forensic science, environmental services, materials-analysis consulting firms, academia, conservation, and government labs. A major source of papers for The Microscope is the Inter/Micro conference held each year in Chicago. Read more about Inter/Micro. Brian J. Ford is the author of the Critical Focus column, published quarterly in The Microscope journal. Ford has given his Evening with Brian presentations at Inter/Micro for almost 30 years. The journal is also open to papers from other meetings or papers written expressly for publication. 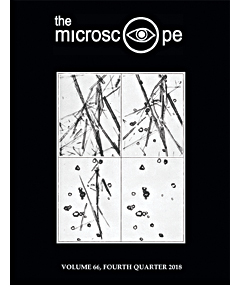 The Microscope is published quarterly by Microscope Publications, a division of McCrone Research Institute. Companies and organizations: One year, $75; two years, $140; three years, $200. Subscription agencies and libraries: $67.50, $126, $180, respectively. Individuals paying personally: $56.25, $105, $150, respectively. Companies and organizations: One year, $111; two years, $212; three years, $308. Subscription agencies and libraries: $103.50, $198, $288, respectively. Individuals paying personally: $92.25, $177, $258, respectively. Back issues for many volumes of The Microscope are still available. Please e-mail themicroscope@mcri.org for availability. To request a back issue of The Microscope or for any other inquires, please call 312-842-7100 or e-mail themicroscope@mcri.org. Note: Individual articles are only for sale if an issue is out of stock. In this case, the charge per article is $7 for a reprint. If a reprint is not available, a scan will be provided for $7. Payment: Credit card (VISA, MasterCard, American Express), company PO, Govt. form 1556, check payable to “Microscope Publications,” or call 312-842-7100 or fax 312-842-1078. Payment must be issued before shipment. Shipping: Unless you specify otherwise, the shipping will be 3-5 day Priority Mail through the United States Postal Service. Send inquires to themicroscope@mcri.org or please call 312-842-7100 for more information.